Monu Skin say to apply just a thin layer on the skin and leave on the skin before removing with warm water and cotton wool/a sponge and patting dry. It doesn’t need to be lathered on in a thick layer at all to be effective, but if you have oily skin then I would suggest keeping it to a thinner layer than if you have dry skin for sure. 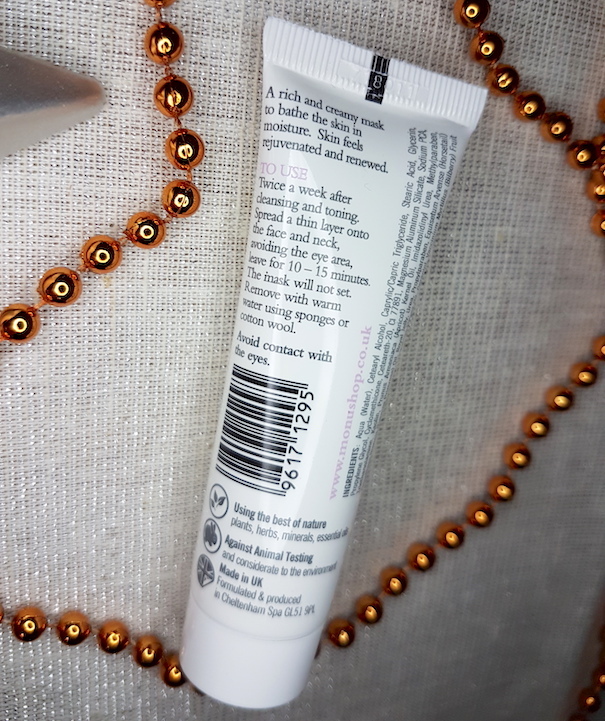 It says that it doesn’t set, and that is true, but I found that it did become slightly hard on the skin whilst waiting for it to be ready to remove. With that said, it is very easy to remove and as soon as the warm water touches it, it is exactly how you'd imagine it to be; like wiping off cream. It doesn’t make the skin feel cool, tingly, or refreshed like lots of other masks do, so if that is the type of mask that you’re looking for then you won’t find it with this one. Instead this is more like a warm hug for your skin. A good hug. One that your skin really appreciates. Your skin is left feeling smooth with a healthy, happy glow. If you have oily skin you need not fear either as this doesn't make your skin oilier or shinier. Just healthy looking. On dry, sensitive skin I would suggest using this more often, such as three times a week. For oilier skin I think that once a week could be enough, maybe twice a week during winter time. If you do have very dry skin then this mask can also be used overnight as well, but I wouldn’t recommend that for oilier skin as it can be a little too much. 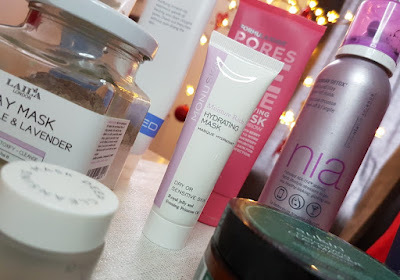 As stated in the intro, Monu Skin even suggest that the Hydrating Mask can be used on the hands, and as someone who deals with super dry, cracked hands in the winter, I was more than happy to test it out. I will give you a straight warning: if you apply this to cracked areas, it will sting a bit. It isn't terrifyingly bad, but it is a little uncomfortable. I left it on for 10 minutes and felt straight away that they were feeling softer and looking a bit happier. I followed it up with the Weleda Skin Food and waited to see how they were in the morning. I have to say that I'm really thrilled with how well it worked! The cracked areas that were stinging are looking and feeling so much better and the dry patches have smoothed out quicker than when using my trusty Skin Food cream alone. I'm not saying I recommend using this mask on cracked areas by the way, I'm just being honest with my own experience and what happened. Overall, I've been really thrilled with how well this Hydrating Mask has been working for me. I find it to be so luxurious which is lovely and it is a fab winter treat for the skin. I do have very oily skin, but recently I have been using a strong retinol cream that has made areas of my skin turn really dry in areas but stay really oily in others, so I’ve been cracking out all of these hydrating and moisturising products to fix the chaos. This is right up there with the top items that have helped to bring my skin back to its regular self, so for that, I thank you Monu Skin. If you would like to try the Monu Skin Hydrating Mask for yourself, you can grab a tube from Look Fantastic. 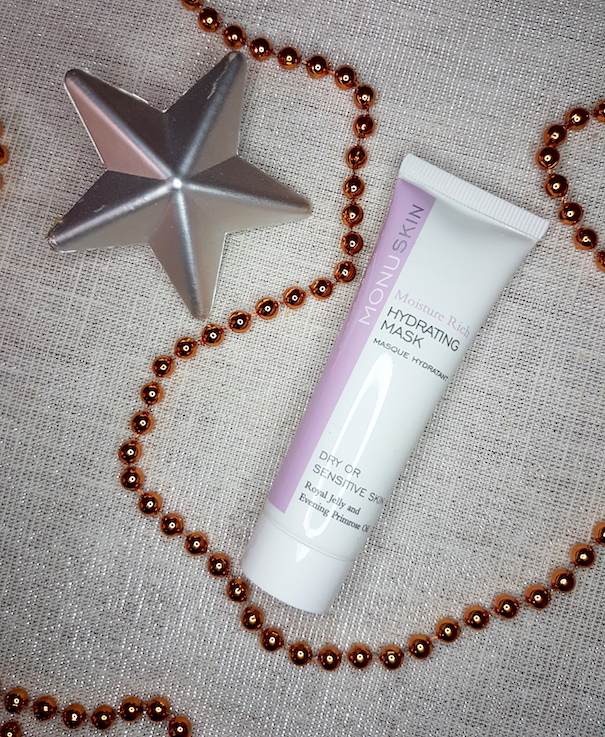 What are your thoughts on the Monu Skin Hydrating Mask? What is your favourite mask for rehydrating your skin?